Biokaas Kinderdijk is located in the windmill scenery of Kinderdijk, The Netherlands, at the outer border of the town Alblasserdam. A unique place due to the fact that in Kinderdijk has the highest windmill density per square meter, worldwide. The nearest mill is situated only 250 meters away, the Nederwaard 8. In between all these mills there is also one accessible for visitors. 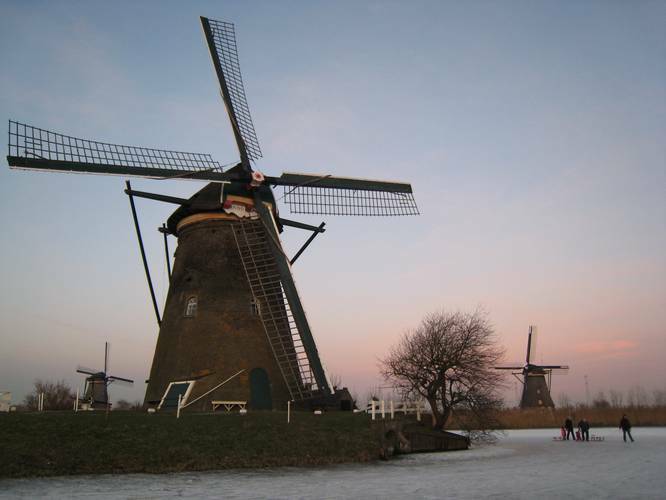 The museum windmill (Nederwaard 2) can easily be reached from our farm, it is only 1 kilometer away; from the "official" entrance of Kinderdijk the museum mill can be reached after 800 meters. This mill is fully operational and has a preserved interior from 1956. In and around this location you can learn more about the background of why the windmill scenery was created centuries ago. As well you can see live how the technology of waterpumping via windmills works, as well as the operations of a mill from top to bottom. The on-site miller can answer all your remaining questions. Around the year 1400 people started draining the Alblasserwaard polder. The main reason was to enable the peatland to be used for agricultural activities, something Biokaas Kinderdijk nowadays still benefits from. The drainage canals were excavated by hand. In order to make sure that the water could be removed, several sluices had to be built. 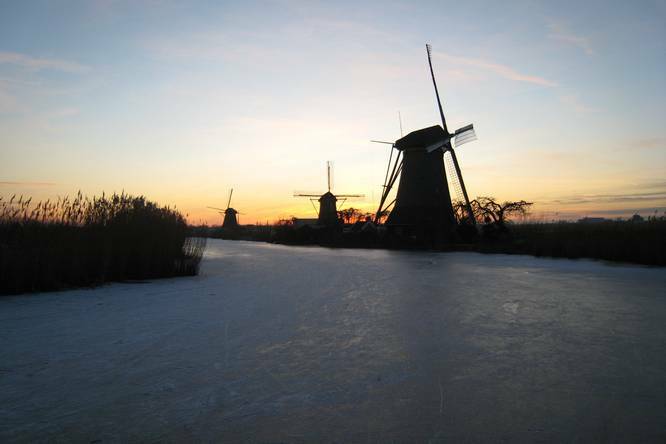 The reason of selecting Kinderdijk for these activities was because in this most western part of the Alblasserwaard polder the ebb level of the water was the lowest. For this reason with the least effort the most water could be channeled. A characteristic of peatland is that it reduces in volume when water is removed; this also causes it to lower in height. For that reason the height difference between river and polder was increasing, causing the drainage to become more and more difficult. This caused the constructing of the Kinderdijk mills around 1740, following the so-called "boezem"-system. A "boezem" is a canal that is initially meant to store water instead of enabling logistics via water. The water was first pumped from the polder into the lower canal (Lage Boezem). Then the mills on the lower polder side (Nederwaard of Alblasserdam) pumped it from the lower canal to the higher canal (Hoge Boezem). Finally the mills on the higher polder side (Overwaard of Nieuw-Lekkerland) pumped the water from the higher canal to the river Lek (originated from the river Rhine). The windmill scenery of Kinderdijk is since 1997 placed on the World Heritage List of Unesco and is therefore considered as "irreplaceable, unique and in ownership of all mankind". The view from the Molenkade where we are situated gives a very nice overview of a large amount of the mills. From our ground the first mill can be spotted very well. Our cows are not so much interested in the unique location where they graze. The fact that they can graze organically is however fully in line with the time period when the mills were built. Herewith the Molenkade seen from our meadows in spring. In the first full week of September all windmills are specially spotlighted in the evenings what gives a fantastic view. The "Blokkerse wip"-mill seen with upcoming fog; the geese do not see the beauty of it. Also in wintertime the scenery gives fairylike pictures. 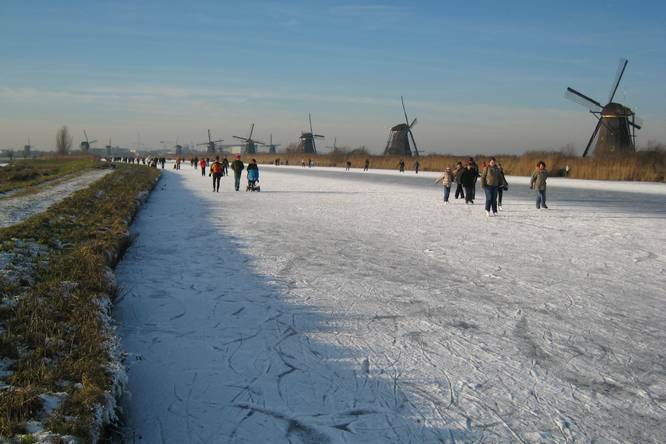 Kinderdijk is also famous for its natural ice skating tours (Molenschaatstochten) where tens of thousands of people join. It only takes place occasionally. Sunset in a wintery setting.